One of the things that can be very important for anyone, but especially creative people, is organization. For some of us, that’s not so easy. I have made a lot of progress in this area over the course of my life, but have yet to achieve perfection. As the little sign on my back door says, Martha Stewart does not live at Burton Cottage!! Let me describe to you the organization I have for writing. I have as the basis of my whole life, my planner. 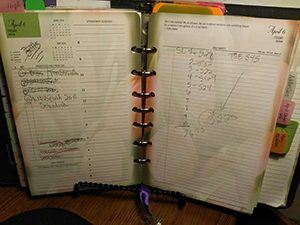 I have a Daytimer Flavia planner (in purple, of course) with Franklin Covey two-page a day inserts in a Blooms theme. 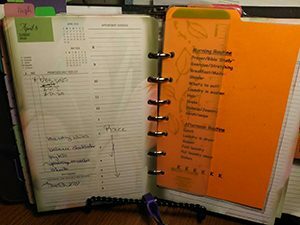 I have, in addition to the ruler/page marker, a divider/page marker that contains my morning, afternoon, and evening “routines.” I don’t follow those routines as well as I should, to be honest. They’re just reminders and guidelines. Every morning, I sit down and list what needs to be done on the left side of the left-hand page. If something has a definite time attached—for example, a dentist appointment, church, or a race—it gets blocked out in the hourly section, with any travel time it might require. 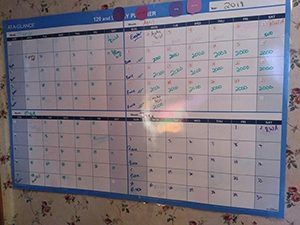 I have already set up some tasks in the color of the day that are repetitive things, like a spot to list laundry loads, and reminders to balance checkbooks and pay bills, and other specific-to-the-day tasks. On the blank, right-hand page, I list word counts. There is a column for web posts that I do for a lawyer, and a column for my current WIP, which I write in 20-minute sprints. Another tool I use frequently is three-ring binders. I have three: Writing Checklists, Etc. ; Austen Authors; and NEORWA V.P. of Communications. They’re pretty self-explanatory. The Writing Checklists binder has my “how-to” sheets for formatting and things. 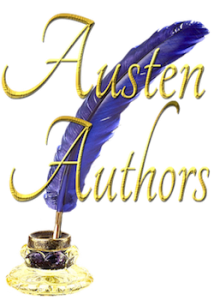 The Austen Authors binder has the current posting schedule and some administrative and how-to things in it specific to the Austen Authors blog and Facebook group. And, the NEORWA binder has officer stuff and stuff about workshops in it, since I’m also Workshop Coordinator and Workshop Moderator. I use the Writing Checklists binder most often, followed by the Austen Authors binder. The NEORWA binder gets used the least, though it’s not at all the least important. I have a large, laminated, four-month calendar taped to my wall. If you ever see a video of me from Facebook, it’s usually behind me, though in the winter, it’s partially hidden behind a door. 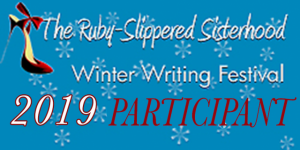 On that calendar, I note Austen Authors blog post dates, and plan out word counts. I’ll often list target dates for story completion and editing, and publication. This is another newish tool to me, and the kinks of working with it are still being ironed out. As for keeping track of plot bunnies, sadly, they are everywhere. I have them on sticky notes attached to pieces of paper, in the back of my planner, in my notebook, and on my laptop sticky notes app. They are everywhere. I guess corralling all of them will be my next project! What tools do you use to organize yourself?